STATEHOOD:The land called Oklahoma was purchased from France, in 1803, as part of the Louisiana Purchase. From 1803 to 1819, Oklahoma was part of several territorial districts as the United States reorganized its land holdings due to boundary disputes and treaties. By 1819, Oklahoma, minus the panhandle, was part of the Arkansas Territory. In the early 1800's, there was intense pressure to remove Indians from the settled east. In response, the U.S. Government reserved Oklahoma for Native Americans and, in 1828, required all settlers to withdrawn from the area. Between 1830 and 1842, a sad chapter of U.S. history, the Cherokee, Chickasaw, Choctaw, Creek, and Seminole Indians (The Five Civilized Tribes) were compelled to give up their homelands and move to Oklahoma. The Cherokee people referred to this migration as the "Trail of Tears." Soon, settlers looking for more property and the railroads looking for revenue coveted the reserved Indian Territory. By the late 1880s, Native Americans were pressured again as Indian Territory was divided into two parts. In 1889, the western half of Indian Territory, including the panhandle, was opened for settlement. On March 2, 1890 this land, plus an additional 3,681,000 acres, was established as Oklahoma Territory by the U.S. Congress and Guthrie was designated as the Territorial Capital. Demands for Indian land continued and the Dawes Commission was formed to bargain with the Indians for their land and to dissolve the Indian nations. In 1905, leaders of the Five Civilized Tribes formed a constitutional convention in Muskogee, inviting settlers to participate. The convention adopted a constitution for a state, called Sequoyah, and voters approved it. The United States Congress was unwilling to accept Indian Territory as a separate state however. Congress wanted Indian Territory and Oklahoma Territory combined into one state. In 1906, representatives from Indian Territory and Oklahoma Territory met in Guthrie to draw up a new constitution that would combine the two territories as one new state. On November 16, 1907, Oklahoma was admitted to the union. The state capital, Guthrie, was moved to Oklahoma City in 1910. A constitutional convention assembled in Guthrie, Oklahoma on November 20, 1906 and worked until July 6, 1907 developing the Constitution of the State of Oklahoma. It was approved by Oklahoma voters on September 17,1907 and went into effect on November 16, 1907 when Oklahoma became the 46th state to be admitted to the Union. Amendments (changes) to the Oklahoma Constitution may be proposed in either the House of Representatives or the Senate. If an amendment is agreed to by a majority of the member of each house of the Legislature, the amendment is presented to the citizens of Oklahoma for their vote. If a majority of voters approve an amendment, it becomes part of the Oklahoma Constitution. The Legislature may also propose that a constitutional convention be held to amend the Oklahoma Constitution. But a proposal for a convention must be approved by a majority of the voters before it may be held. As designated by the Oklahoma Bill of Rights, voters may also petition (make a formal written request) the government to begin formal proceedings on a proposed amendment. 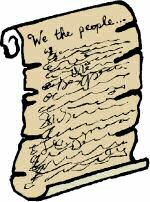 PREAMBLE:Invoking the guidance of Almighty God, in order to secure and perpetuate the blessing of liberty; to secure just and rightful government; to promote our mutual welfare and happiness, we, the people of the State of Oklahoma, do ordain and establish this Constitution. STATE MOTTO:Oklahoma's motto is the Latin phrase, Labor Omnia Vincit. It dates back over 2,000 years to the writing of a Roman poet named Virgil. Virgil's phrase, Labor omnis vicit, is found in the first of a series of four Latin Poems, Georgics. These poems were written in support of Augustus Caesar's "Back to the Land" campaign to encourage more Romans to take up farming. The phrase is found in a section of the poem describing the growth of agriculture from primitive beginnings. 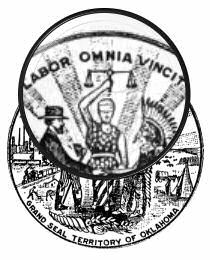 Translated as "Labor Conquers All Things," by the state of Oklahoma, the phrase was incorporated into the design of the Grand Seal of the Territory of Oklahoma during the second session of the Territorial Legislative Assembly held in Guthrie, January 1893. This is shown, magnified, to the left on the territorial seal. The phrase was later specified as a feature of the Great Seal of the State of Oklahoma in the 1907 Oklahoma Constitution. STATE GOVERNMENT:As in the case of the federal government, Oklahoma's state government is organized into three branches - executive, legislative, and judicial. The state government is a product of three documents: the United States Constitution, the Oklahoma State Constitution, and laws of the state. The Governor of Oklahoma is the chief executive officer of the state, is elected for a four-year term, and may serve an unlimited number of terms but not more than eight years in a row. He or she is responsible for appointing certain state officers, veto or approval of bills passed by the Legislature, granting pardons and paroles, calling special sessions of the legislature, and commands the state militia. The Governor is also responsible for the preparation of the state budget and ensures that all laws are obeyed in the state. The Oklahoma State Legislature is the lawmaking branch of the state government. The Legislature has the authority to pass laws that people must obey. The Legislature is also responsible for raising and distributing the money necessary to run the state government. The judicial branch of the Oklahoma Government interprets the laws. The Oklahoma Court System is made up of the Supreme Court, the Court of Criminal Appeals, the Court of Civil Appeals, and 77 District Courts. Unlike most states, Oklahoma has two courts of last resort. The Supreme Court determines all issues of a civil nature, and the Oklahoma Court of Criminal Appeals decides all criminal matters. Members of these courts, and of the Court of Civil Appeals, are appointed by the governor from a list of three names submitted by the Oklahoma Judicial Nominating Commission. The Oklahoma capitol was designed, classic Greco-Roman, by English architects Wemyss Smith and	Solomon A. Layton in 1914. Ground was broken for the capital building on June 10, 1914 by Governor Lee Cruce. Over 5,000 people in attendance. Construction began on August 4, 1915. The exterior is Indiana limestone and the base is Oklahoma pink granite from Troy, Oklahoma. The outside steps and tables are made of black granite from Cold Springs, Oklahoma. Floors are Alabama marble and the stairs and wall bases are Vermont marble. 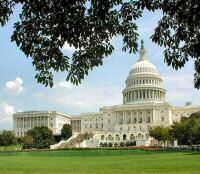 The capital building opened on June 30, 1917 without the dome that was included in the design. A temporary "saucer dome" was built to close the building. With no dome, the capitol was nicknamed "Old Baldy." 85 years after the capitol was opened for business, a capitol dome was dedicated on Oklahoma statehood day, November 16, 2002. Many portions of the temporary dome were saved as historic artifacts including the stained glass skylight, plaster crown, and cut limestone. The Oklahoma Capitol is surrounded by working oil wells. The well in front of the entrance is nicknamed "Petunia #1" because the drilling began in the middle of a flower bed. The 6,000 pound, 22-foot tall, bronze Native American warrior that stands on top of the capitol dome is called "The Guardian." It was sculpted by State Senator Enoch Kelly Haney, an American Indian of Seminole and Creek descent whose family followed the Trail of Tears to Oklahoma seven generations ago. It's the first statue representing Native Americans to be placed on top of a state capitol. 1912 Olympic champion Jim Thorpe, who was a member of the Sac and Fox tribe. STATE REPRESENTATION:The Oklahoma Legislature is divided into two parts, referred to as houses or chambers. The two houses are the Senate and the House of Representatives. A legislature with two houses is called a bicameral body. The Latin roots of the word bicameral, "bi" and "cameral," mean two chambers or rooms. There are 48 senators serving in the Oklahoma Senate and 101 representatives serving in the Oklahoma House of Representatives. STATE REPRESENTATIVES:Representatives in Oklahoma each represent people in a specific area of the state. These areas are called house districts. There are currently 101 men and women representing 101 house districts in the Oklahoma House of Representatives. 48 representatives are Republicans and 53 are Democrats. Each representative serves for a period of two years in the House of Representatives, after which he or she must run for re-election. A representative may not serve for more than a total of 12 years, or six terms. 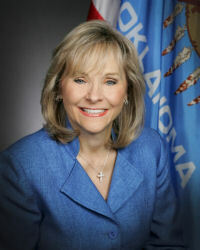 STATE SENATORS:Senators in Oklahoma each represent people in a specific area of the state. These areas are called senate districts. There are currently 48 men and women representing 48 senate districts in the Oklahoma Senate. 20 representatives are Republicans and 28 are Democrats. Each senator serves for a period of four years in the Senate, after which he or she must run for re-election. A senator may not serve for more than a total of 12 years, or three terms. LEGISLATIVE PROCESS:The legislative branch of government is responsible for making and maintaining laws within their jurisdiction. United States representatives and senators, federal legislators, are responsible for laws at the national level and state legislators are responsible for laws at the state level. 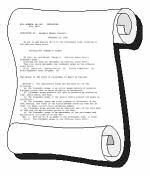 A law begins as an idea that is introduced in the Oklahoma Legislature as a bill by one or more legislators. The bill then goes through the legislative process to become a law. During this process the bill may be changed. Not all bills become law. CURRENT LEGISLATION:When the legislature is meeting, it is said to be "in session." Regular sessions of the Oklahoma Legislature meet once a year, beginning at noon on the first Monday in February. Regular sessions must be adjourned (ended) by 5 p.m. on the last Friday in May. Normally, the Legislature is in session Monday through Thursday. In odd-numbered years, the regular session will also meet at 12:00 noon on the first Tuesday after the first Monday in January. This session will be adjourned (end) no later than five p.m. on the same day to declare elections. Extraordinary sessions may be called by the Governor or by the Legislature itself. The following link will allow you to look at bills that are currently going through the legislative process. 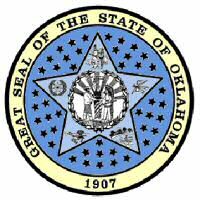 STATUTES:The following link will allow you to look at Oklahoma's current laws. There are 77 counties in Oklahoma. The largest county, at 2,251 square miles, is Osage County. The smallest county, at 371 square miles, is Marshall County. The greatest number of people live in Oklahoma County; 660,448 according to the 2000 census. The fewest people live in Cimarron County; 3,148 according to the 2000 census. The citizens of Oklahoma elect two people, like every other state, to represent them in the Senate and five people, based on Oklahoma's population, to represent them in the House of Representatives.